How are you all? Well, 2016 has come and fashion lovers have started tracking down the latest trends which will rule. Some of these trends are being repeated may be because we just love them and never want to say goodbye. Apart from that, some fierce beauty ethics are also introduced in 2016. Let’s take a look. 1. Glittery eye lids – if you are a fearless fashionista who is always ready to experiment with outfits and makeup, I have got a task for you. Jazz up your eye look with glitter eyeshadows and pigments and make the heads turn. 2. Brushed up brows – this trend is generally used on models in various fashion weeks and photo shoots. Brushed up brow style is going to be the next topnotch trend after eye brow tattoos. 3. Dramatic French nail tips – who does not love French manicure? Well, this time the French tip fashion is going to thrive with the evolution of dramatic transformation into an ‘on the go’ basic pattern. 4. Clean gloss for instant glow – having a dewy glow on face is all that we need to look effortlessly amazing. You can achieve a perfect dewy glow instantly by applying a clear gloss on the features (facial) you want to highlight. Makeup artists have used the trick in fashion shows and now the trend is out for 2016. 5. Short and simple nails – If you have short nails, then this point shall bring a smile on your face for sure. 2016 year will introduce the fashion of short and simple nails. Moreover, dramatic French tip pattern will not affect the grace of soberly short nails. 6. Light or elusive contouring – 2015 gave us strobing and clown contouring, but 2016 will be ruled by elusive contouring which is supposed to be a lighter version of ordinary contouring. This makeup technique seems to take place of strobing which was highly admired and appreciated in 2015. 7. Short hair – girls with short hair are usually considered to acquire a carefree attitude and this is obvious because they do not need to spend their time for deciding everyday hairdos. This hairstyle will be in the limelight this year. 8. Naturally lined pouts – the time has come when you should start loving the actual shape of your lip because naturally lined and colored pouts are included in the list of best beauty trends of 2016. 1. Bold lips – luckily you are authorized to have some fantabulous bold lipsticks in your beauty box to redefine your chic style. 2. 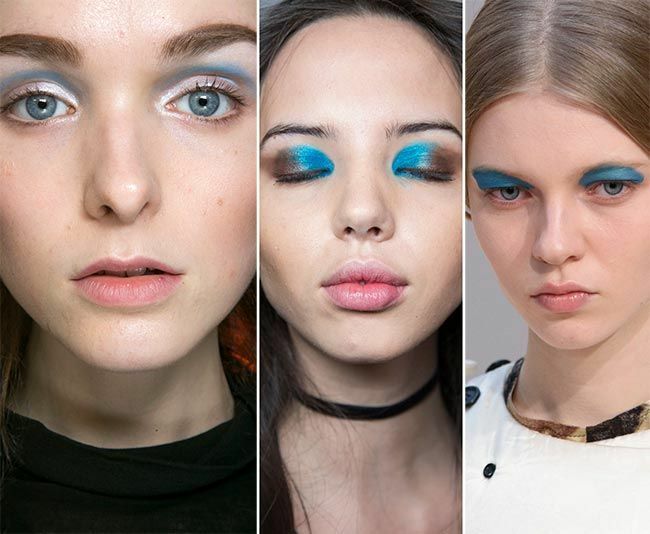 Blue lids – if you forgot to try mesmerizing electric blue eye makeup look last year, you have entire 2016 to give it a go. 3. Pixie cut – the grace of pixie cut hairstyle is just beyond the comparison and this is the reason why it has been significantly mentioned in 2016 beauty trends. 4. Smokey eyes/cat eyes – get ready to dazzle the captivating cat eye look with the latest double winged pattern. Hope these updates will help. I will back soon with more beauty updates; till then take care. 8 Strange Beauty Trends That Have Gained a Lot of Attention! Revealed: Korean Beauty Secrets For Flawless Complexion! Brushed up brows – like Cara Delevingne’s? Wow, that would be different. Her brows make her look fearless. I am excited about glittery eye lids.